Apply for a new PC Financial Mastercard® and earn up to 125 PC Optimum per $1* spent at Shoppers Drug Mart for the rest of the year. All PC Optimum members earn 15 points per dollar at Shoppers Drug Mart and Pharmaprix. When you use your President’s Choice Financial World Mastercard you will earn an additional points 20 points per dollar. Earn 20 PC Optimum points for every $1 spent at almost 2,500 stores across the country. Visit pcoptimum.ca for details on participating stores where the PC Optimum program is offered. New cardholders can enjoy a low balance transfer rate of 0.97% for 6 months. 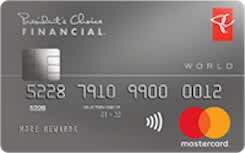 PC Financial® Mastercard® is provided by President’s Choice Bank. President’s Choice Bank is not responsible for maintaining or monitoring the accuracy of the content on this website. To the extent of any inconsistency with information at the provider’s site, the terms at the provider’s site shall prevail. For full details and current product information click on the “Apply now” button. Please note: Credit approval and eligibility is subject to a number of factors in addition to credit score. A minimum annual personal income of $60,000 or household income of $100,000 is required for this card. If you do not meet the minimum income requirements for the President's Choice Financial® World Mastercard®, your application will be considered for the standard President’s Choice Financial® Mastercard®. Terms and conditions apply; visit card provider’s site for more information including additional interest rates and fees. All information is subject to change. Terms and conditions apply; visit card provider’s site for more information including additional interest rates and fees. All information is subject to change. This CAD currency 47 is issued by PC Financial and runs on the MasterCard Network. The purchase interest rate for this credit card is: percent annually and the transfer balance interest rate is: 22.97% per year. Also the cash advance rate is: % per year. Travel cancelation is Not available for this credit card and also travel accidents are Not available.